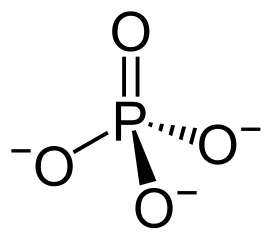 Phosphate, chemical formula PO43-, is a chemical compound made up of one phosphorus and four oxygen atoms. When it is attached to a molecule containing carbon, it is called a phosphate group. It is found in the genetic material DNA and RNA, and is also in molecules such as adenosine triphosphate (ATP) that provide energy to cells. Phosphates can form phospholipids, which make up the cell membrane. Phosphate is also an important resource in ecosystems, especially in freshwater environments. This figure depicts a phosphate group. DNA and RNA, the genetic material of all living things, are nucleic acids. They are made up of nucleotides, which in turn are made up of a nitrogenous base, a 5-carbon sugar, and a phosphate group. The 5-carbon sugar and the phosphate group of each nucleotide attaches to form the backbone of DNA and RNA. When nucleotides are not attached to other nucleotides to form part of DNA or RNA, two more phosphate groups are attached. Phosphate groups are important in activating proteins so that the proteins can perform particular functions in cells. Proteins are activated through phosphorylation, which is the addition of a phosphate group. Protein phosphorylation occurs in all forms of life. Dephosphorylation, the removal of a phosphate group, deactivates proteins. Adenosine triphosphate, or ATP, is the main source of energy in cells. It is made up of adenosine and three phosphate groups, and the energy derived from ATP is carried in the phosphates’ chemical bonds. When these bonds are broken, energy is released. ATP is formed when the molecule ADP (adenosine diphosphate) is phosphorylated. Phosphate groups are also found in other energy molecules that are less common than ATP, such as guanosine triphosphate (GTP), cytidine triphosphate (CTP), and uridine triphosphate (UTP). Phospholipids are the main component of cell membranes. Each phospholipid is made up of a lipid molecule and a phosphate group. Many phospholipids arrange in rows to form what is called a phospholipid bilayer, a double layer of phospholipids. This bilayer is the main component of membranes such as the cell membrane and the nuclear envelope that surrounds the nucleus. It is semipermeable, meaning that only certain molecules can pass through it and enter or exit the cell. Phosphate is an important buffer in cells. A buffer keeps the pH of a substance neutral, not too acidic or too basic. Living things need to have neutral conditions for life because most biological activities can only occur at a neutral pH. Phosphate-buffered saline, a buffer solution containing water, salt, and phosphate, is often used in biological research. Phosphorus is a nutrient that limits the growth of plants and animals in freshwater environments. An increase in phosphorous-containing molecules like phosphates can cause more plankton and plants to grow, which are then eaten by other animals like zooplankton and fish, continuing up the food chain to humans. An increase in phosphates will initially increase the numbers of plankton and fish, but too much will limit other nutrients that are important for survival, like oxygen. This depletion of oxygen is called eutrophication and can kill aquatic animals. Phosphates can increase due to human activities such as wastewater treatment, industrial discharge, and using fertilizers in agriculture. About 85% of the phosphorus in the human body is located in bones and teeth. Calcium phosphate is the main element of both teeth and bones, and gives them their hard structure. Phosphorus is the second-most common element in the body after calcium, and it is important to have neither too much nor too little of it in the body. Phosphorus can be found in grain products, milk, and foods high in protein. Phosphorus – a chemical element that, with oxygen, forms the molecule phosphate. Phosphorus has an atomic number of 15 and is represented by the letter P.
Nucleotide – the building block of DNA and RNA; consists of a phosphate group attached to a 5-carbon sugar and nitrogenous base. Adenosine triphosphate (ATP) – the main energy molecule of cells, made up of an adenosine molecule attached to three phosphate groups. Phospholipid – the main component of cell membranes, consisting of a lipid attached to a phosphate group. 1. Which of these activities involves phosphate groups? D is correct. These are all functions of phosphate groups. Phosphates provide energy to cells in the form of ATP, activate proteins through phosphorylation, and limit the growth of life when they are too abundant in an ecosystem. 2. Phosphate consists of phosphorus bonded to what other element? A is correct. A phosphate is made up of one phosphorus atom attached to four oxygen atoms. When a molecule of phosphate is attached to a carbon-containing molecule, it is then known as a phosphate group. C is correct. Phosphorylation is when a phosphate group is added to a molecule. Phosphate groups can activate proteins through phosphorylation.